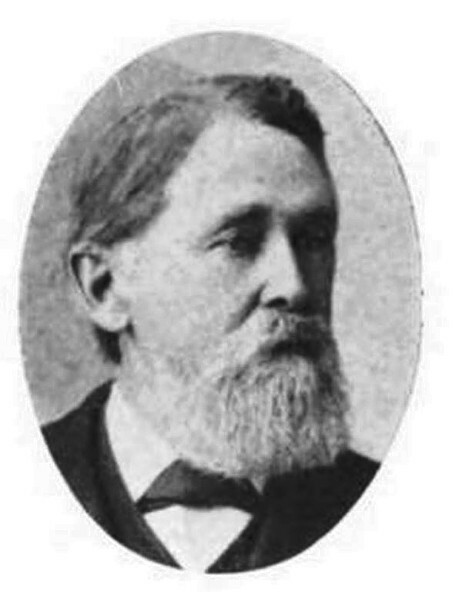 Joseph B. Reed, proprietor of the Cairo Foundry and Machine Shops, Cairo, Ill., was born in Lowell, Mass., March 16, 1831. He is the son of Thaddeus Reed, a native of Massachusetts, who died when Joseph was only six years old. The mother was Catherine Dow, a native of Maine. She died in Boston, Mass., at the age of seventy-six. After the death of Thaddeus Reed she was married to a Mr. Ballard, a newspaper man of Boston. Joseph B. Reed had one brother, Charles Reed, who died in the early fifties while en route to California as a home seeker, and one sister, Miss Phoebe Ann Reed, of Boston. The late Henry S. Reed, of St. Louis, Mo., once president of the National Bank of Commerce of that city, was a half-brother of Joseph B. Reed, being the son of his father by a former marriage. Joseph B. was reared in Lexington, Mass., whither his parents removed from Lowell when he was a child. In early life he learned the machinists' trade in Lawrence, Mass. At the age of twenty-five he went to Cumberland, Md., where for two years he was superintendent of a machine shop. In 1856 he went to St. Louis, Mo., where for many years he was proprietor of the Laclede foundry and machine shops. He came to Cairo, Ill., in 1864, upon the solicitation of the United States government for the purpose of establishing a machine shop to do repair work on the government river fleet. Upon coming here, he founded the present Cairo foundry and machine shops which have been in continuous operation ever since and are among the oldest and most successful machine shops on the Ohio river. During the war he built a number of tugs for the government when General Fremont was in command of the Western army. These tugs were built at the foot of Carr street on St. Louis levee, and used for tenders for the large boats. He also built at the same time two for the Wiggins Ferry Company of St. Louis to be used in the harbor, two for Joe Gartside of St. Louis and two for Captain Sam Brown of Pittsburg, used in Memphis and New Orleans harbors for jobbing and towing coa1. Mr. Reed is sole proprietor of the works. He is also sole proprietor of the Cairo iron and machinery supply store in Cairo, which was established in 1871. Mr. Reed is a Republican, but in no sense a politician. In religion he is a Presbyterian. On Dec. 13, 1856, he married Helen S. Stickney of Beverly, Mass., who yet survives. They have had six children, two of whom died in infancy. The four living ones are Joseph H. Reed, of Chicago, where he is employed in a large heavy hardware house; Helen S. Reed, a teacher in the Iowa State college at Ames; Frank S. Reed, associated with his father in Cairo, and Miss Sarah Alice Reed who is at present teaching elocution and history in the Cairo high school.